Federal employees believe Republican presidential nominee Donald Trump would be more effective than his Democratic opponent Hillary Clinton in preventing a terrorist attack on U.S. soil, according to a new poll. Feds gave the Republican nominee a slight edge over Clinton, with 44 percent of respondents saying Trump would be more effective and 41 percent picking Clinton. 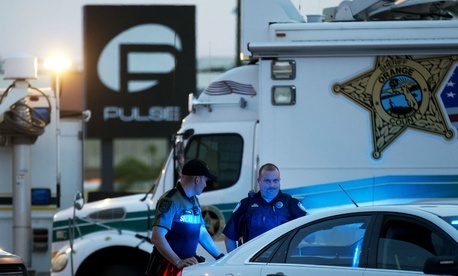 About 15 percent said they were not sure which of the 2016 contenders would better prevent terrorism. The poll was released this week by Government Business Council, the research arm of Government Executive Media Group. Federal workers favored Trump for preventing terrorism in the United States despite preferring Clinton overall. The same survey found Clinton holding a five-point lead over Trump in a general election match-up. 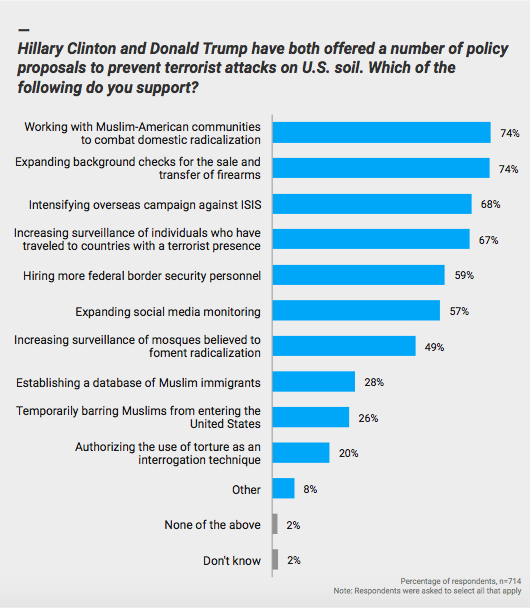 On specifics, federal employees supported most fervently policies proposed by Clinton to combat terrorism. Nearly three-quarters of respondents said they were in favor of working with Muslim-American communities and expanding background checks for the sale and transfer of firearms. Two-thirds backed strategies both Clinton and Trump have supported, such as intensifying the overseas campaign against ISIS and increasing surveillance on individuals who have traveled to countries with a presence of terrorism. A majority also supported hiring more federal border security personnel and expanding social media monitoring. Nearly half of federal employees said they back boosting surveillance of mosques believed to foment radicalization, while 28 percent expressed support for signature Trump proposals of establishing a database of Muslim immigrants and temporarily barring Muslims from entering the United States. Only one in five feds said they support authorizing the use of torture as an interrogation technique, another of Trump's campaign promises. 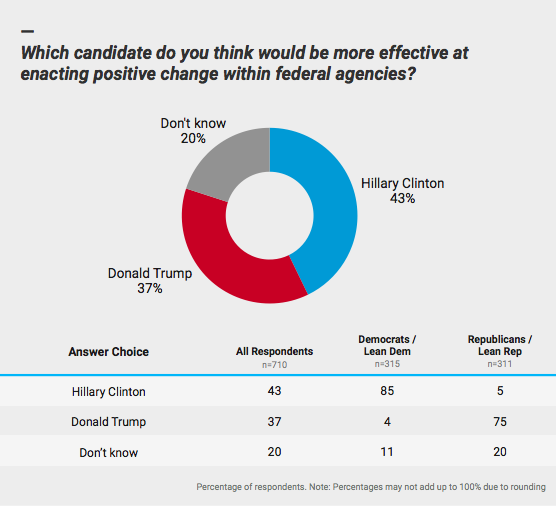 On a governmentwide basis, federal employees said Clinton would be more effective at enacting positive change at agencies than Trump. Forty-three percent of survey respondents picked Clinton as a better change agent, compared to 37 percent for the GOP nominee. Feds were fairly evenly split on Clinton’s impact on their individual jobs, with 27 percent saying she would aid their ability to do them, 30 percent saying she would impede it and 29 percent saying she would have no effect. A much higher percentage -- 43 percent -- said Trump would impede their ability to do their jobs. Similarly, 46 percent of feds said the Republican nominee would impede agencies’ ability to recruit new employees, compared to just 21 percent who said he would make it easier. Respondents were again fairly evenly split on Clinton’s impact on recruiting. The poll was sent to a random sample of Government Executive subscribers from July 12-18. 768 federal employees, representing over 30 civilian and defense agencies, completed the survey. Of those, 33 percent said they identify as Democrats, 30 percent as Republicans, and 28 percent as independent (independent respondents leaned Republican by a 44 percent to 35 percent margin). The margin of error is plus or minus 4 percent.